A Montessori environment is characterized by freedom when choosing the work to be done, but it doesn’t exist free of limits. What happens in a Montessori environment with respect to freedom and limits? A Montessori school is not a place where there is unbridled freedom, but neither is it a school in which children simply follow the teacher with blind obedience. It is in fact, a place that offers a prepared environment, available to children, in which freedom of choice is offered but clear rules that must be respected for the proper functioning of the environment are expected. Discipline is part of the universe, there is a cosmic order and certain patterns that need respect for natural laws. Because of this order, things are in relation to one another, including human beings. Children have an internal guide. Freedom is the right of the person to act without restrictions as long as their acts do not interfere with the equivalent rights of others. Natural discipline must come to the child through freedom, so freedom and discipline are two sides of the same coin. There can not be one without the other. If the child is allowed to work according to his internal order, he acquires external order, calmness, and self-discipline. -Choose the material with which they want to work. -They should be based on the golden rule: "treat others as you would like to be treated"
The freedom of movement, action and expression that children have, gradually helps them to achieve one of the main objectives: to be independent. Any unnecessary help is no more than an obstacle to the development of the child. The children soon understand and internalize them because they realize that they are necessary for the proper functioning of the classroom. They understand that there must be a balance between individual freedom and the needs of the group. Writing with chalk is one of the first lessons a Montessori classroom offers in the process of writing. Hello dear Jackrabbit families! Happy 2019. It was so nice to see the children come back full of positive energy and ready to get back to their daily routine. Thank you so much to Alex and his family for taking care of Lucy and Charlie (our class pets) during the break. We had to say good bye to our friends Easton and Catie who started their journey in the Elementary program…we sure miss them already. The children have been so wonderful welcoming four new friends into our community. Kaia, Lili, Dylan, and Lorenzo are the new jackrabbits. The children have been spending time working hard on their lessons and receiving many new ones. It’s amazing to see how independent they have become. We had a visitor from another school last month and before she left she shared with me how amazing it was to be able to witness how the children take full ownership of the classroom. From helping to fold laundry in the mornings, prepare snacks, arrange flowers for the tables, unload and load the dishwasher, sweep, mop, to help clean up the classroom at the end of the day. They truly obtain ownership of the environment…after all this is a “Children’s House”. Thank you to all the parents who were able to attend parent night, it is always wonderful to be able to share insights of Montessori Education and the way children learn in the classroom. Hope you can join us for “journey” next February 1st and 2nd. I am also looking forward to seeing you at the annual charity event on February 23rd. Come dress up like the 80’s, have fun, and most of all please help us raise funds to to support scholarships for our children eighteen months to five years of age. That being said, I would like to thank our amazing room moms, Stacie, Yezica, Rajwant, and their volunteer helpers, Micah, Teresa and Cris, for all their dedication and hard work helping us make a beautiful class project for the auction as well as a basket. Not only they work hard and volunteer their time, but they manage to do this with a smile on their faces. Thank you! It was wonderful seeing everyone walk into the door with a story to share, a smile on their face, and ready to get back into their routine. The children have been hard at work with new lessons and practicing ones that were given before break. We have welcomed Sunshine and Moonlight into our classroom, our new pet birds! The children spent a lot of time thinking about names for our new pets and then voted on what they should be called. We also have had two new faces join our Bobcat community, Cristiano and Xander from the toddler community. Our snack for the month has been pizza, which everyone has seemed to enjoy. The children are able to spread the pizza sauce on the pita bread, place the sliced tomatoes, grate the cheese and spread it around, and then place into the toaster oven. While the pizza has made for a great snack in the classroom it has also led to many math equations! Each morning the children making snack need to figure out how many pizzas to make and how many slices to cut each pizza into. Thank you to those who attended our community meeting on spoken language in the Montessori classroom. It is always a good time to come and get some extra insight into the philosophy, meet some new parents, and see the classroom. We have a lot of events coming up this month. I look forward to seeing everyone at the charity event with your best 80’s gear on! We also have the Creo Montessori Journey to look forward to. You will be able to see all of the different levels at this time! The child has learned each land and water form and is now practicing reading while labeling each formation. When finished labeling the child will check his own work. The child is slicing tomatoes for the pizza. It will be added to the pizza under the cheese! The Blank Addition chart helps highlight the child’s attention to the few combinations he still needs to memorize, serving as a test of known facts. The Bow-Tying Frame helps the child become independent in the classroom. With this skill they are able to tie their shoes or a friends, tie their own apron, tie a bow when working a book, and so much more. How delightful it has been to welcome all of our smiling tiny faces back after winter break. We started the ‘new year’ strong, with lots of big work and enthusiasm. Our snack this month has been a major hit; who knew healthy ingredients disguised as pizza would spark so many valuable work opportunities. From grating cheese, to picking fresh basil from the garden, to slicing fresh tomatoes, baking it in the oven, and using a child-safe pizza slicer, the children have been thrilled to say the least! Healthy habits start young! The new year always brings an immense amount of HOPE. One way we can continue this inclination over the next few months is by attending or supporting our upcoming annual charity event. I think it’s fair to say, as fall conferences came to a close and having the opportunity to observe, that the young children in our community have been gifted with a treasure of an early educational experience. Although there are over 7,000 accredited Montessori Schools worldwide, this is not a large enough number. We want Montessori for all children; this truly starts in our own backyard. Providing a solid foundation during the early years has proven integral for a child’s success throughout their life. 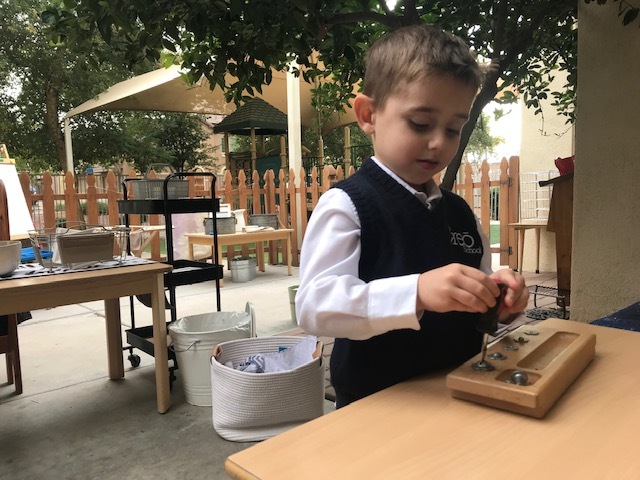 The children’s home away from home, Creo, being an authentic internationally accredited Montessori, has the power to instill a love of learning and offer an overall impact on Arizona as a whole while sharing this important work. Each donation is essential in supporting our children 18 months to five years of age. Not only is the cause worthy, it’s a super duper fun night, grins all around. Your attendance alone is a contribution. Thank you to all who attended our community meeting. Taking the opportunity to gather and dissect aspects of Montessori education is a key part of your child’s Montessori journey and ultimate success. I shared a bit of the children’s new found love of Chopin’s music. They are particularly keen on his fast pace waltz compositions. This month also brought a few discussions about Martin Luther King Jr. Day and the importance of freedom in America. We had many “I have a Dream” proclamations following our discussions, in the sweetest most organic words you could imagine. We are looking forward to the continued growth of the class throughout the Spring Semester. To offer the opportunity for the child to apply memorized information for the essential combinations in division. Creating their own labels containing the article, adjective, and noun to label the farm animals. The child listens to classical music, takes a moment to herself, and enjoys looking through books. The child looks through a food anatomy book and discovers the difference between American and Thai place settings. The child first learned the names of the countries in Asia with the Puzzle Maps. Promoting independence, concentration, and care of self. The older child reads the recipe and the younger child assists. To help the child read and write irregularly spelled words. To help the child explore and analyze known language in order to represent words with graphic symbols. The child plays a [Bring Me Game] with the adult, bringing different symbols of a certain category. Welcome back and Happy New Year!!! It has been so nice seeing all the children and how excited they are to return to their favorite activities. Along with all the work being done, the children are busy catching up with their friends and sharing stories of how they spent the winter break. We will be welcoming Nathan from the toddler community this month into our classroom. All our plants and flowers survived the cold winter break. The children recently harvested 4 chile peppers, basil and parsley for our pizza snack, 3 bell peppers and an eggplant!!! Even though it has been a little cold in the mornings, the children still love working outside. I am looking forward to seeing everyone at the parent night on January 17th. Spoken and written language will be covered at this meeting. I am also looking forward to all who are attending the Silent Journey and the Charity Auction. Using small stamping tools to practice fine motor skills will indirectly prepare the hand for writing. Ironing is part of Care of the Environment work. It engages the child in concentration, precision, and problem solving skills. Creating a map allows the child to practice writing, reading, and research skills. This board encourages linear counting, pattern recognition, and problem solving skills. Flower arranging is a great way for the child to take ownership in the environment. It not only adds beauty to the classroom, it also gives the child a chance to practice fine motor skills. Reading a map legend gives the children a chance to learn the states, collaborative learning, and research. Preparing snack gives the child a chance to practice fine motor skills, organizational skills, and ownership in serving classmates. Creating a book of all the flags of the United States is a time consuming project. The child learns time management, organizational, and research skills. Labeling the geometric solids gives the child the freedom to explore the shapes, practice handwriting skills, and an overall sense of accomplishment. Practicing the essential combinations of division. Preparing the daily hand towels for lunch takes hand-eye coordination, concentration, organization, and fine motor skills. Working with and symbolizing the conjunction work. The association between the quantity and written symbol of the numbers 11-19. Washing the table after doing the chalkboard work. This encourages the child to care for the environment, problem solve and use fine and gross motor skills.